"Wave has not seen the user adoption we would have liked. We don’t plan to continue developing Wave as a standalone product, but we will maintain the site at least through the end of the year and extend the technology for use in other Google projects." Shame, could have been a good product if enough people joined. I actually used it to plan a trip to London today, granted the trip now isn't going ahead, but it was a good way to lay out the plans. I use Buzz less than I do Wave, although my updates go to it, I never check to see anyone else's! Was Wave ever advertised to the "average" user? As it's still in Labs I'd guess not. Maybe that's why it didn't get the user base. The consensus seems to be that the Wave development team will be working on the new social networking (Google Me?) platform. Seems like many of its features could be useful in something like that and they likely need those resources for the new project too. I think it was mostly a cutting-edge solution without a problem or at least without a well thought out use case. Google is jumping the gun on this one.Give it time. It is a great product. Surely Google execs didn't expect it to take over the world within the year?! This is the unhappiest I have been about any Google decision. I fully expected Wave or Wave-features to revolutionize GMail within the next 3 years. WTF, Google! Don't discontinue Wave. Can't help commenting again. 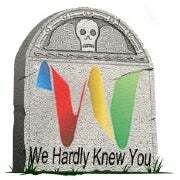 Almost every day at work, caught up in email hell, I have wished we could use Google Wave for official business. It would help us TREMENDOUSLY. Why is Google Wave being discontinued before it had the full opportunity to unleash its power in the enterprise? This is the lamest decision ever by Google. > the world within the year?! But maybe they expected certain growth rates or certain loyalty rates. I for one (nothing representative of course) never used the tool again after trying it out a couple of times, and not finding a good use case for it. Looks like (me and) Ionut's prediction had come true. 12: Google Wave won't become successful, but its features will be used in other Google products. IMHO Wave much way to complicated. I struggled for one hour to understand how it works and to get the first "Wave" to appear on screen. It was annoying like hell. People want ease of use, the "don't make me think" kind. That's why Twitter succeeded and Google did origially as well. What really killed wave IMO was the invite-only ramp up scheme and the nature of the product are in direct contradiction to each other. Wave is only useful as a collaborative tool if every single person you want to collaborate with on something is able to access it; if even one person that you want in the discussion is missing it is completely and utterly useless and you find some other means of communication. Invites worked well with GMail simply because you didn't need to know anyone else using GMail for it to be useful to you; you can send and receive from everyone that uses any email client. Wave on the other hand had tons of people wanting to try it out and some subset of those people got the initial invites; without all their friends on it it was pretty much useless to them. They killed it 2.5 months after opening it to everyone and enabling it on google apps, I can't see how it's really about numbers of users, something else is going on. Anyway, can we run waves ourselves? Is there FLOSS code that does everything? Wave has few users but no ads. Kill it. Knol has no users but few ads. Keep it. E. Schmidt just said that they will use Wave technologies to "new technologies that are not announced yet". This could mean that they plan to launch new products with Wave features (social network? new apps for the Docs suite?) rather than put them in current apps such as Gmail, Buzz and Docs. Unless technologies =! service. To this day, I don't understand what Wave is?